I’ve been a fan of Mizuno for quite some time now. 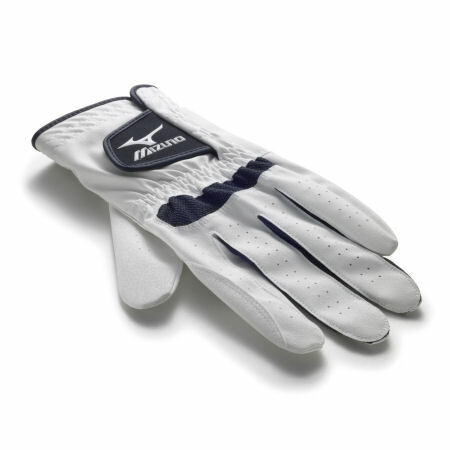 I used to own Mizuno golf clubs, once upon a time when I was still entrenched in the sport of Golf. 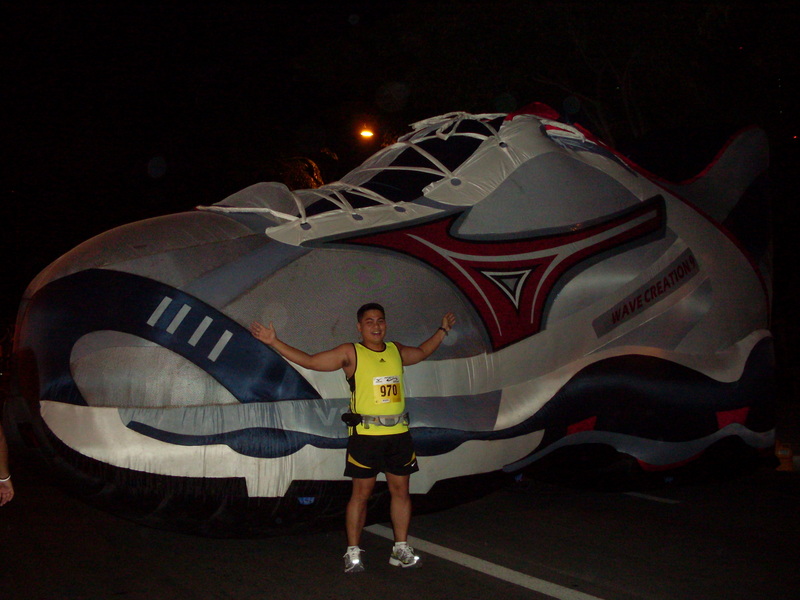 My first serious running shoes were a pair of Mizuno Frontiers which I bought from Second Wind. Read my review https://gailcons.wordpress.com/2009/07/26/my-shoes-my-reviews-and-i/. Thanks Hec for the recommendation. 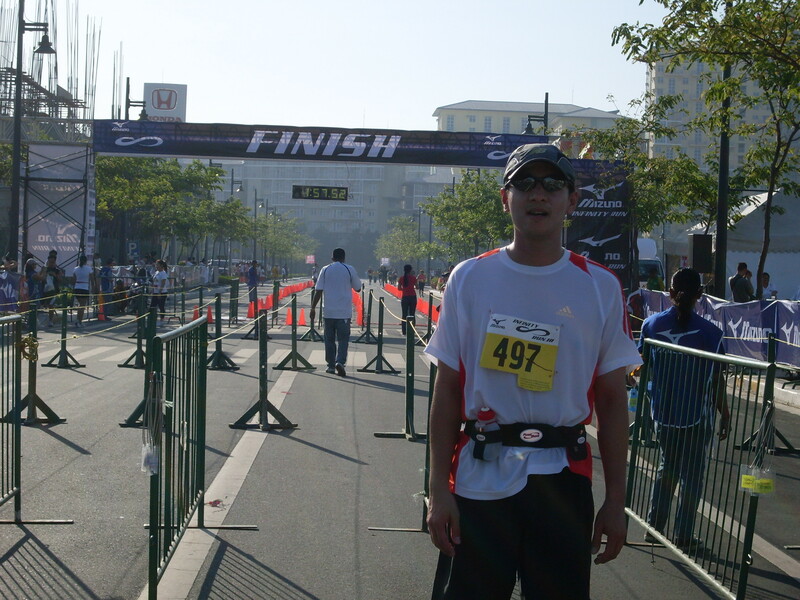 Since I was a Mizuno Run Club graduate, it was expected that I would join the IR2010. So I vowed to be one of the first to register. Registration started early and lasted until early April. The race kit included the bib and a Mizuno bag. A finisher short was allocated as well. And all these for only P450 (15k) and P400 (5k). Now that’s an excellently priced race. 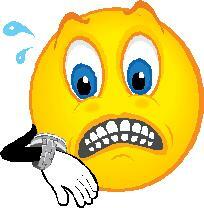 However, being the procrastinator that I am, I only tried to register a few weeks before the run. And of course, we ran out of 15k race kits. There weren’t 10k kits available anymore! I was so ready to settle for a 5k kit. 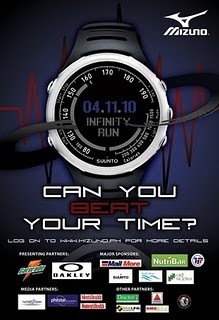 It was a good thing Jai of Mizuno had cousins who backed out from the 15k event. Nice! 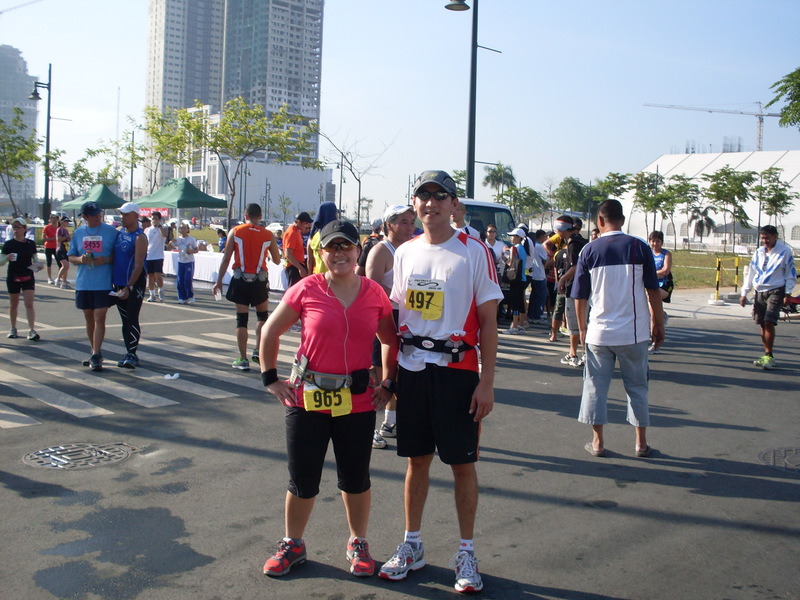 One of my good friends from Dagupan, Robert, wanted to join me on this race. He was looking for a 10k kit. However, since there was none, I bought him a 15k kit from a fellow Happy Feet runner who registered for the event but couldn’t make it. The gun time for 15k was 5:30am. Noy and I were already at the event close to 5am. I wanted to make sure we weren’t late for Robert’s 1st 15k race. This would actually be his farthest distance. I was a bit worried (and excited at the same time)but somehow I knew he could do it as he does cross country biking. I was excited enough to bring a camera with me during the race something that I don’t do. I programmed a 5:1 run-walk Interval workout in my Garmin and promised Robert that I’ll stay with him until the end of the race. Since this was one of Noy’s training days, I asked him to go ahead with his program while I support Robert. I loved the way the marshals placed barriers between the 10k and 15k runners, allowing only the 15k runners to fill the assembly area near the starting line. This way, it won’t be mayhem by the starting line. 3,2,1 and we’re off! I wanted to stay at the tail end of the runners to make sure Robert wasn’t pressured to run fast at the start of the race losing gas half way. 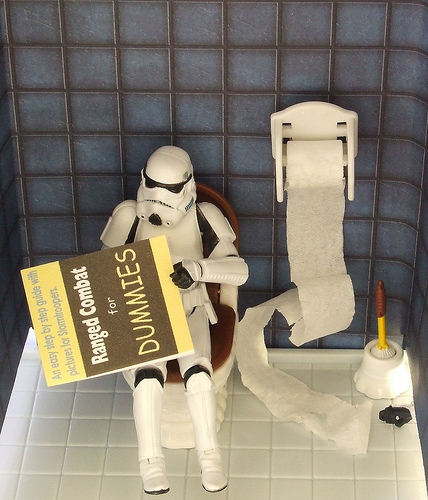 We took our time, even passing by McDonald’s for a toilet break. Robert was doing very well. He managed to keep pace until Buendia. I didn’t want him to make unnecessary stops so I ran ahead to get him cups of water or Gatorade. I wanted to make sure he doesn’t get dehydrated and start a cramp. 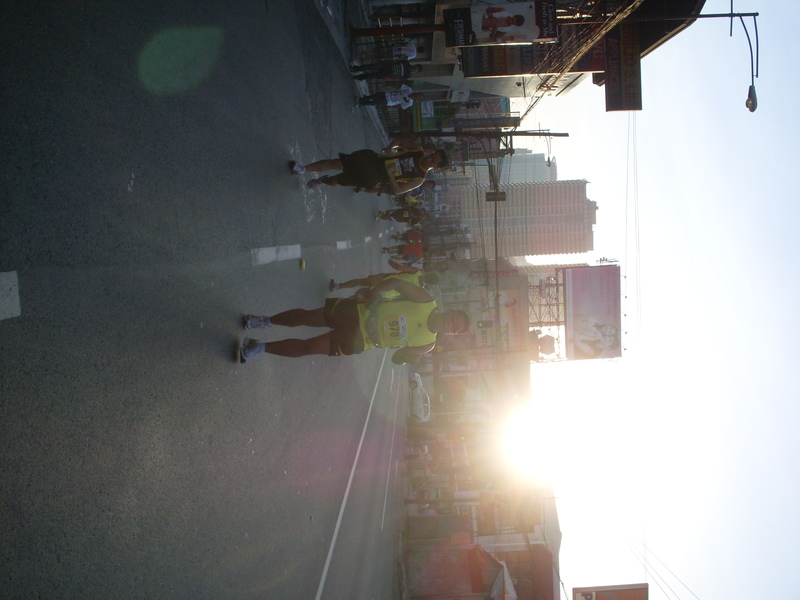 We were along Buendia when elite runners were already on their way back. They even had escorts 🙂 Nice! Saw a bunch of friends headed back. They were running so seriously. Bryan, Timmy, Hector, Sam were all “in the zone”. They probably had a targeted time to beat. Only Vic and Tere were upbeat and managed to smile and wave. Noy was doing great as well. He ran past us and so far passing South Super Hway, we haven’t managed to overtake him yet. By the time we got to Buendia-Filmore, I lost Robert. I realized I was so busy looking for Noy that I didn’t look back to check if he was still keeping pace. Oh well, I wanted to take a photo of hubby first. I can come back for Robert later. I finally saw hubby! He was on his way back while I was still approaching the U slot. Great! Good job Noy! I ran ahead then back to check on Robert. He was running continuously. Slowly but surely. On the way back, Robert was tired. He took frequent walk breaks while I keep him company. 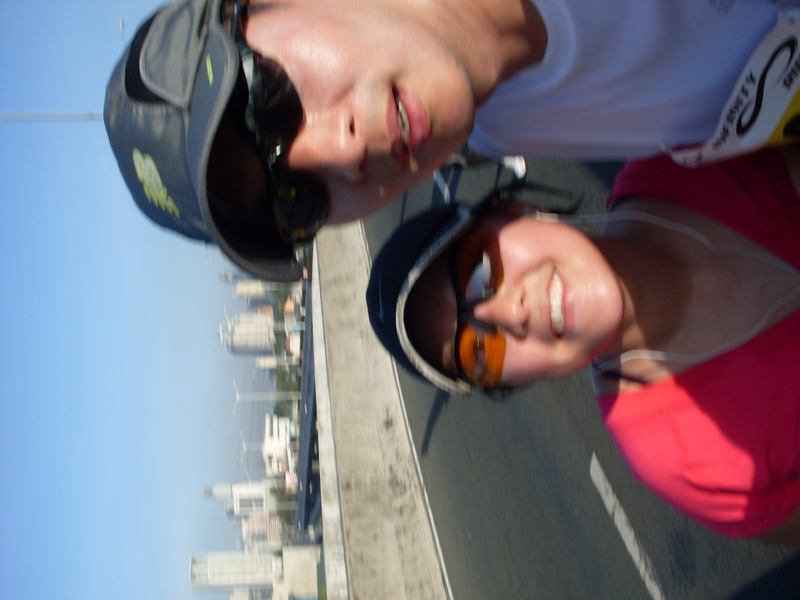 By the time we got to the Kalayaan flyover, the sun was up and hot. I saw Craig, Michelle and Justin Logan. They’re back from a trip to the US. After a short chat with Michelle, I pulled back to run beside Robert. I did my usual positive cheering hoping that he won’t give up on the race. We walked back towards the race area. About 500m from the finish line, I encouraged him to run slowly. About 100m, I decided to sprint towards the finish. I wanted to take a picture of him finishing the race. At about 1:56, Robert finished his 1st 15k with a pace of 7:48. Not bad for a newbie runner. Mizuno was the perfect race Robert’s 1st 15k. 1. This event did not have too much people. It wasn’t that crowded in the assembly area and even along the course. 2. Affordable race fee. 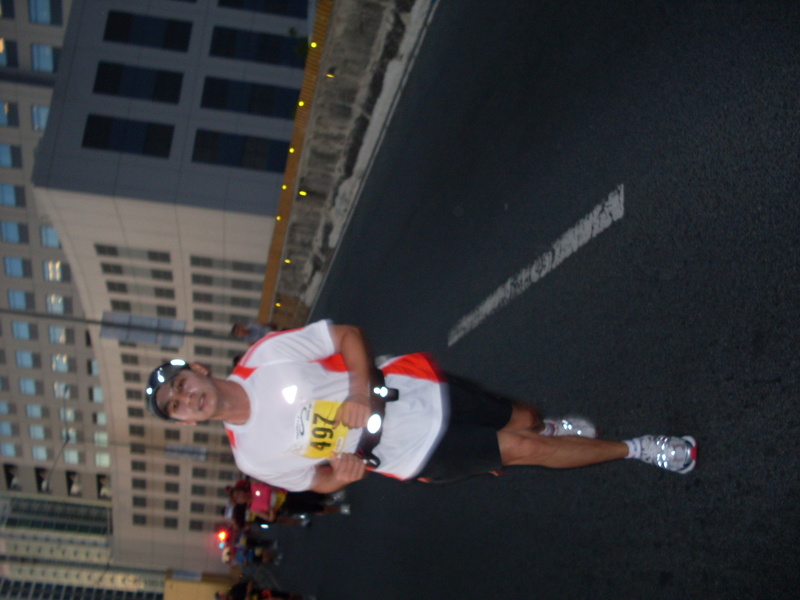 P450 for a 15k race, free bag, finisher’s shirt + sports drinks along the route….not bad at all! 3. Roving timer. I’m not sure if everyone saw this but there was a roving timer to update runners on the race’s elapsed time. 4. No frills finish line. I have very little complaints. Some are complaining that the finisher shirts did not have their sizes, that the Gatorade only had one flavor, there was no Photovendo to take pictures etc. But for me, this is how a race should be. It wasn’t too commercial. The race fee wasn’t exorbitant. There was ample water + energy drinks (as a plus). There were freebies (bags and finisher shirts). For P450, this is definitely worth it! Keep it up Mizuno! awww… me too 😦 don’t worry, will run our LSD soon. noy and i will be doing one on May 1. join us! target distance is 27k.